SacRT has joined the 20th century! 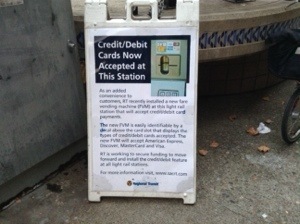 There are now twelve fare vending machines that accept credit and debit cards for purchasing tickets. Though the machines are all located at light rail stations, the tickets can be used on SacRT buses as well. Most months I buy a monthly pass, but since in February I am gone about half the days, I decided to buy by the day, and it has been very convenient to have these machines. Though two of my most commonly used stations don’t have them. There are 52 stations on the light rail system, and each has one or more fare vending machines. When I moved to Sacramento nearly three years ago, I was frustrated that the machines, which were clearly designed to accept cards, did not. Every other transit system I used in my travels did accept cards at some to all stations, and having a system that dealt only in cash was a disappointment. There will eventually be a region-wide fare card, similar to the Clipper card used in the Bay Area, for Sacramento. 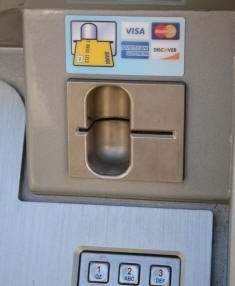 I don’t know whether this capability will be added to the existing machines, or whether new machines will be installed. Next Post SacRT smoke free!